Sandra has been dedicated to Beth Israel for 26 years, where she was a founding member in 1987. She served as Treasurer from 2010-20’123 and is currently the Sisterhood President. Sandra has organized and been in charge of the Sisterhood Shabbat services for many years. Sandra has been the Beth Israel representative to the Interfaith Social; Action Council since 2010. As a member of the Chai Chapter of Hadassah, Sandra served as Vice President from 2012-2013. She has volunteered with the Sun City Security Patrol, the Ruskin Library, and Wimauma Elementary School, and she was a highly-regarded teacher of fourth and fifth grades. She also was President of the Sandpiper Golf Club Ladies Nine Hole League from 2011-2013. 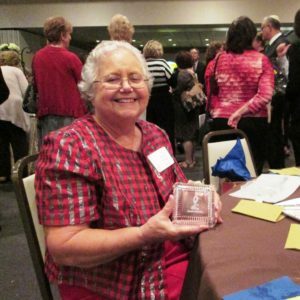 Sandra received the Community Woman of the Year award from Beta Sigma Phi, Laureate Zeta Pi Chapter in 2012 in recognition of her volunteer activities. Sandra has been married to her husband, Martin, for 52 years. They have two children and four grandchildren.